So I have a wicked neat plan to make Joe a special treat. 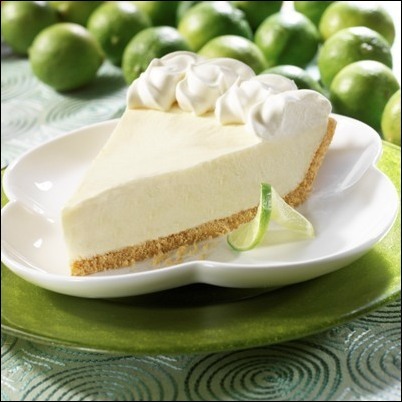 I was watching the Barefoot Contessa the other day and she made an uber quick frozen keylime pie! Joe and I have been limeing it up with our summer beverages so I thought, “No time like the present.” He will return on Thursday night and I know part of the prep time is waiting for it to freeze in the fridge. When he sees it he will want to eat it immediately so I gotta get crackin’. Unlike the Contessa however, I will not be making my own whipped cream topping and crust. Let’s get real!! Click on the pie to learn how to make your own.